Protologue: Repert. Spec. Nov. Regni Veg. 13: 382 (1914). Alstonia congensis auct. non Engl. Alstonia boonei occurs from Senegal and Gambia to western Ethiopia and Uganda. The wood of Alstonia boonei, called alstonia in international trade, is used for light construction, light carpentry, open boats, moulding, furniture, interior joinery, implements, boxes, crates, matches, pencils, sculptures, and for veneer and plywood. It is locally popular for the production of household implements because of its good working properties and stability. In Ghana it is used for the famous Asante stools, and in Nigeria for sound boxes of musical instruments of the Yoruba people. The wood is also used as firewood. 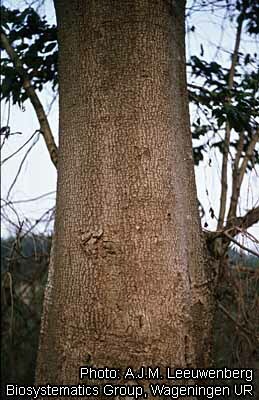 The bark of the bole is important in traditional medicine. In local markets in West and Central Africa it is often amongst the most common plant materials sold as crude drugs. A bark decoction is widely used to treat malaria, typhoid fever, gonorrhoea, yaws, asthma and dysentery, and is also applied to sores, ulcers, snakebites, rheumatic pain and toothache, and as a galactagogue. A maceration of the bark is taken to treat jaundice, cough and sore throat, and is applied externally to treat skin complaints. The bark is also used as an anthelmintic. The latex is applied to snakebites, skin complaints and swellings caused by filaria infections, and in concoction to treat fever. The leaves are applied topically to reduce oedemas and to treat sores. The latex has been used as birdlime and as an inferior alternative for rubber. Alstonia boonei is a useful shade tree for coffee, tea and banana plantations. Although Alstonia timber of Asian origin (mainly from Indonesia and Malaysia) is important on the international timber market, it is only occasionally exported from African countries, and then probably mostly in mixed consignments of light-weight timber. Although Ghana exported 64,500 m³ and 19,500 m³ in 2000 and 2001 respectively, and Cameroon 210 m³ in 2001, it is of greater importance locally. The bark of Alstonia boonei is commonly sold on local markets for medicinal purposes. In Yaoundé (Cameroon) the price of the bark varies from 1–3 FCFA per gram, depending on prescription. The heartwood is creamy white and indistinctly demarcated from the up to 20 cm wide sapwood. The wood darkens upon exposure to light. The grain is straight, occasionally wavy, texture moderately coarse. Growth rings indistinct or absent. The wood has a disagreeable smell when green. The wood is lightweight. The density is 360–420 kg/m³ at 12% moisture content. The shrinkage rates are moderately low, from green to oven dry 3.8–4.0% radial and 5.2–5.4% tangential. 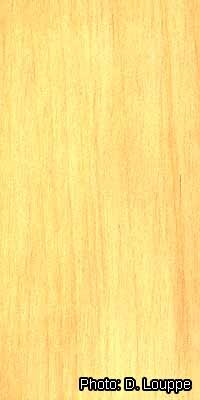 The wood dries rapidly, with slight risk of distortion and checking. Once dry, it is stable. At 12% moisture content, the modulus of rupture is 48–73 N/mm², modulus of elasticity 5790–10,500 N/mm², compression parallel to grain 27–37 N/mm², shear 6–7 N/mm², cleavage 10 N/mm and Janka side hardness 1820 N.
The wood is easy to saw, although the presence of latex may cause clogging of sawblades. The wood is slightly sticky when freshly sawn due to the latex. The peeling characteristics are good. Nailing and screwing usually do not cause problems, although the nail- and screw-holding capacity may be poor, and glueing, painting and varnishing give good results. The surfaces produced are generally smooth if sharp cutting edges are used. The steam-bending properties are poor. The wood is not durable. It is easily attacked by fungi and very prone to blue stain. It is susceptible to dry-wood borers, powder-post beetles and termites. Consequently, it should be treated as soon as possible after felling. It is only suited for indoor use, and cannot be used in contact with the ground or exposed to the weather. However, it is easy to treat with preservatives, absorbing over 480 kg/m³ using open tank or pressure systems. In tests with mice and rats anti-inflammatory, antipyretic and analgesic properties of Alstonia boonei stem bark have been demonstrated, but it is not efficient in treating malaria. Several alkaloids have been isolated from the bark. One of these is the indole alkaloid echitamine, which showed several pharmacological activities (e.g. hypotensive activity and relaxing activity of smooth muscles) in animal test models. However, this compound showed only very limited antiplasmodial effect. The triterpenoids lupeol and α-amyrin, as well as esters of these compounds have been isolated from stem and root bark; these showed anti-inflammatory properties. Alcoholic extracts of the bark (and to a lesser degree of the leaf) showed a broad-spectrum activity against both gram-negative and gram-positive bacteria, as well as fungi. The latex may cause blindness. The wood of the closely related Alstonia congensis Engl. is used indiscriminately from that of Alstonia boonei. The wood of both species has similar uses to that of Triplochiton scleroxylon K.Schum. and Antiaris toxicaria Lesch. In drugstores Alstonia boonei has been used to adulterate Holarrhena floribunda (G.Don) T.Durand & Schinz and its latex has been mixed with that of Funtumia elastica (Preuss) Stapf and other latex-producing species. 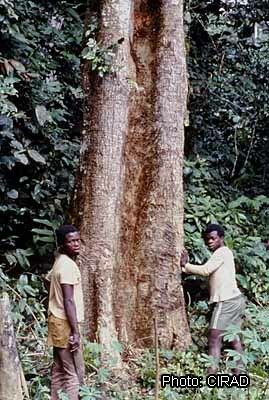 Large deciduous tree up to 45 m tall, with latex; bole branchless for up to 25 m, up to 100(–140) cm in diameter, fluted at the base or with steep buttresses up to 4(–8) m high; bark smooth or rough, usually with large lenticels, greyish or pale brown, inner bark creamy or pale yellow, with copious latex; crown layered, with branches in whorls. Leaves in whorls of 4–8, simple and entire; stipules absent; petiole up to 2.5 cm long, flattened and grooved above, with narrowly triangular colleters at base; blade obovate, 6–20(–25) cm × 2.5–7.5 cm, cuneate to obtuse at base, rounded to shortly acuminate at apex, leathery, glabrous, many-veined with lateral veins joining near the margin. Inflorescence a terminal, compound, umbel-like cyme up to 23 cm long; peduncle 2–6(–13) cm long, stout; bracts up to 2.5 mm long. Flowers bisexual, regular, 5-merous, fragrant; pedicel 2–5(–7) mm long; sepals up to 2(–2.5) mm long, fused at base, pubescent; corolla cream-coloured or pale yellow, pubescent, with tube 5–14 mm long, narrowed around the middle, lobes obliquely ovate, 2.5–6 mm long; stamens inserted in upper part of corolla tube, filaments up to 1 mm long, anthers up to 1.5 mm long; ovary superior, ovoid, pubescent, 2-celled, style slender, 3–8 mm long, ending in a pistil head composed of a basal ring, a cylindrical central part and an elongate cleft stigmoid apical part. Fruit composed of 2 linear follicles 22–57 cm long and 2–4 mm in diameter, densely pubescent, many-seeded. Seeds oblong, flattened, 4.5–6 mm × 1.5–2 mm, brown, with long hairs up to 2 cm long on the ends. Seedling with epigeal germination; hypocotyl 2.5–3.5 cm long, epicotyl 1–2 cm long; cotyledons leafy, persistent for 2–3 months, shortly stalked; first leaves opposite. Alstonia comprises about 40 species and has a pantropical distribution. Only two species are indigenous in Africa, both belonging to section Alstonia. Alstonia congensis Engl. differs from Alstonia boonei in its usually sessile leaves, glabrous sepals and glabrous follicles, and also in surface sculpturing of the lower leaf epidermis (stomata concealed below wax chains in Alstonia boonei, exposed in Alstonia congensis). In much of the older literature concerning West Africa, the name Alstonia congensis has been erroneously used for Alstonia boonei. Alstonia macrophylla Wall. ex G.Don is occasionally planted as an ornamental in tropical Africa, e.g. in Sierra Leone, Côte d’Ivoire, Angola and Zimbabwe. It originates from tropical Asia, where is it a fairly important timber tree and medicinal plant. Its wood is heavier, stronger and harder than that of Alstonia boonei and Alstonia congensis. Vessels: 5: wood diffuse-porous; 13: simple perforation plates; 22: intervessel pits alternate; (23: shape of alternate pits polygonal); 25: intervessel pits small (4–7 μm); 29: vestured pits; 30: vessel-ray pits with distinct borders; similar to intervessel pits in size and shape throughout the ray cell; 42: mean tangential diameter of vessel lumina 100–200 μm; 46: ≤ 5 vessels per square millimetre; 47: 5–20 vessels per square millimetre. Tracheids and fibres: (61: fibres with simple to minutely bordered pits); (62: fibres with distinctly bordered pits); 66: non-septate fibres present; 68: fibres very thin-walled; (69: fibres thin- to thick-walled). Axial parenchyma: 78: axial parenchyma scanty paratracheal; 86: axial parenchyma in narrow bands or lines up to three cells wide; 87: axial parenchyma reticulate; 92: four (3–4) cells per parenchyma strand; 93: eight (5–8) cells per parenchyma strand. Saplings may reach 2 m tall in the first year, and 10-year-old trees of 15 m tall and 25 cm in bole diameter have been recorded in Ghana. The tree is deciduous at the end of the rainy season. In West Africa trees flower from November to January and fruit from January to February. The flowers are pollinated by insects, especially by honey bees, but also by butterflies, wasps and beetles. The seeds are dispersed by wind. Alstonia boonei forms endomycorrhizae. Alstonia boonei occurs in primary as well as secondary, moist evergreen to dry semi-deciduous forest up to 1200 m altitude. It is in general a light demander, but tolerates shade when young. Seedlings are most common in medium-sized to large forest gaps and abandoned plantations, and are not found in deep shade. Alstonia boonei is less abundant in regions with high rainfall. It is sometimes found in swampy locations and along streams, but usually occurs in drier habitats than Alstonia congensis. A comparatively high density of Alstonia boonei trees indicates former disturbance of the forest cover by humans. Alstonia boonei regenerates well in forest gaps and abandoned cultivation areas, but in closed forest and older secondary forest only larger trees are found. Germination of seed takes 18–25 days. Immersion in water for 24 hours or manual scarification enhance germination from about 30% to 85%, whereas treatments with sulphuric acid and boiling water destroy the seeds. There are about 33,000 seeds per kg. The trees coppice readily. They are often damaged by strong winds and break at the level of the branch whorls. Logs frequently have brittle heart. The logs float easily in water, and can be transported by river. They are very susceptible to insect and fungal attack and should be dried quickly or treated with preservatives after felling. They are not well suited for rotary peeling because they are often deeply fluted. The return after sawing is poor, being reduced by the latex canals in the wood and by the nodes of whorled branches. Alstonia boonei is widespread and in many regions common, also in secondary forest, and does not seem to be easily liable to genetic erosion. However, cutting Alstonia boonei trees for timber and collection of the bark for medicinal purposes may cause serious threats to local populations. 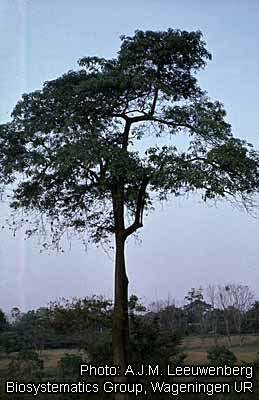 In the Dja biosphere reserve in Cameroon, for instance, Alstonia boonei is endangered because its bark is much collected to treat malaria, and this is also the case locally in Ghana. The problem is aggravated by the fact that Alstonia boonei bark recovers poorly after damage by exploitation. In Senegal Alstonia boonei is completely protected. Alstonia boonei has potential to serve as a substitute of Triplochiton scleroxylon K.Schum., which is an important low-weight timber species in West Africa. However, export prospects are doubtful because of the poor durability and limited uses of the wood. It may be useful as an auxiliary plant in agriculture because it is easy to propagate, grows moderately fast and develops a taproot which does not interfere with the superficial root system of the crop. The effectiveness of Alstonia boonei and other Alstonia species in the treatment of malaria is controversial, and more research is still needed to confirm the claimed medicinal activities. World Agroforestry Centre, undated. Agroforestree Database. [Internet] World Agroforestry Centre (ICRAF), Nairobi, Kenya. http://www.worldagroforestry.org/Sites/TreeDBS/aft.asp. December 2004. Abu, G.B., 1992. Phytochemical and antimicrobial screening of Alstonia boonei. B.Pharm. degree thesis, Department of Pharmaceutical Chemistry, Faculty of Pharmacy, Kwame Nkrumah University of Science and Technology, Kumasi, Ghana. 29 pp. Mapongmetsem, P.M., Duguma, B., Nkongmeneck, B.A. & Selegny, E., 1998–1999. Germination des semences, développement et croissance de quelques essences locales en zone forestière. Tropicultura 16–17(4): 175–179. Ojewole, J.A.O., 1984. Studies on the pharmacology of echitamine and alkaloid from the stem bark of Alstonia boonei (Apocynaceae). International Journal of Crude Drug Research 22(3): 121–143. Olajide, O.A., Awe, S.O., Makinde, J.M., Ekhelar, A.I., Olusola, A., Morebise, O. & Okpako, D.T., 2000. Studies on the anti-inflammatory, antipyretic and analgesic properties of Alstonia boonei stem bark. Journal of Ethnopharmacology 71(1–2): 179–186. Rajic, A., Kweifio Okai, G., Macrides, T., Sandeman, R.M., Chandler, D.S. & Polya, G.M., 2000. Inhibition of serine proteases by anti-inflammatory triterpenoids. Planta Medica 66(3): 206–210. Sam, G.H., 1993. Phytochemical investigation and standardisation of Alstonia boonei De Wild. MPhil. Pharmacognosy degree thesis, Department of Pharmacognosy, Faculty of Pharmacy, Kwame Nkrumah University of Science and Technology, Kumasi, Ghana. 137 pp. Palla, F., 2005. Alstonia boonei De Wild. In: Louppe, D., Oteng-Amoako, A.A. & Brink, M. (Editors). PROTA (Plant Resources of Tropical Africa / Ressources végétales de l’Afrique tropicale), Wageningen, Netherlands. Accessed 11 April 2019. This page was last modified on 19 March 2017, at 16:58.